Hiding among all the good news this week, I learned that the next engine I had on order from SMR trains, the flexible beam Washington, has been cancelled. According to the Dave Schneider, the owner of SMR Trains, the Korean manufacturer has increased the price beyond economic feasibility. It's too bad because the Washington was one of the engines that actually ran on the Aquia Line. I blogged about it here and here. So, when life gives you lemons, make lemonade. This setback will help incentivize me to scratchbuild the loco. I have that task on my bucket list, so now is the time to try it. This week I completed the manuscript for my next book for Kalmbach Publishing. This one has a working title of "45 Track Plans." Yes, the book contains 45 new track plans ranging from 18 to 2500 square feet. The subject matter is mostly in the United States, but there are some plans set in England, France, Peru, Iran in WWII, and even one in the future on Mars. The eras covered range from the 1860s to the modern and beyond! The Mars layout is a based on the scenario described in Robert Zubrin's book, "The Case for Mars." The layout looks at what an iron hauling railroad might look like on the Red Planet. The omnipresence of iron is how the planet got its name. 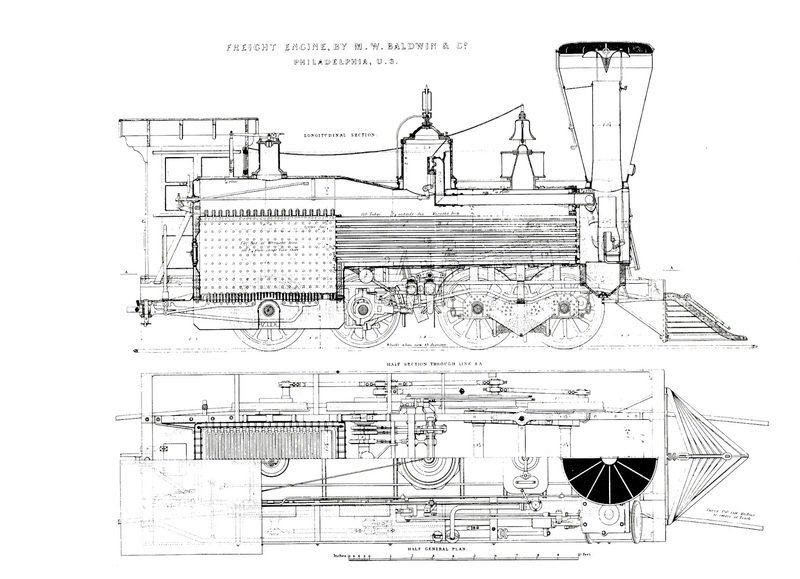 The railroad is based on sound science and technology just extrapolated to the future. I had a friend who is a geology professor at Arizona State (and a model railroader), as well as aeronautical engineers from NASA, Northrop Grumman and the FAA look at it for feasibility. The Iran plan also bears special mentioning. The railroad across the Zagros Mountains is one of the more spectacular railroads in the world. There are hundreds of tunnels, thousands of bridges and a Tehachapi style loop under a mountain! During WWII the USMRS operated the sections from the Persian Gulf to Teheran. It was a busy railroad in an important era in history. For this book, I adopted some improved graphic techniques. So these layouts look "prettier" than my earlier efforts. I plan to update my home layout drawing soon to reflect these new techniques. Look for the book sometime around next Christmas. Dan Toomey from the B&O RR Museum stopped by last night and took delivery of the Lincoln car model. It will be part of the War Came By Train exhibit at the B&O Museum, which will open soon. They have had over a million visitors already. If you haven't seen it yet, this is the last year for the exhibit. In April they plan to reenact the Lincoln Funeral visit to Baltimore in 1865. This was a very difficult model to build, especially given the large scale. I am glad it is done and Dan was happy with it. With that project done, I will have time to get cracking on Aquia Landing, the next major phase of my layout. Well, actually,...I am wrapping up another book for Kalmbach, but I will start on Aquia after that. John Hill passed away today of heart failure in New Mexico. Most known for his game designs such as Squad Leader and Kasserine Pass, John was also a die hard civil war historian, reenactor and game designer. He designed the wonderful civil war game Johnny Reb. I first met John at a game convention where I played in a Johnny Reb game he hosted. We became good friends. We worked on many joint projects. I have many fond memories of those. In large measure I can attribute my interest in the Civil War to his influence. He was an amazing military historian. He had a knack of getting to the crux of an issue. He was brutally honest, but fair. He was also an excellent model builder. He taught me many scenery and modeling techniques and tips. This photo of an N Scale diorama is one of the joint projects we worked on. Alas I don't have many other good photos. 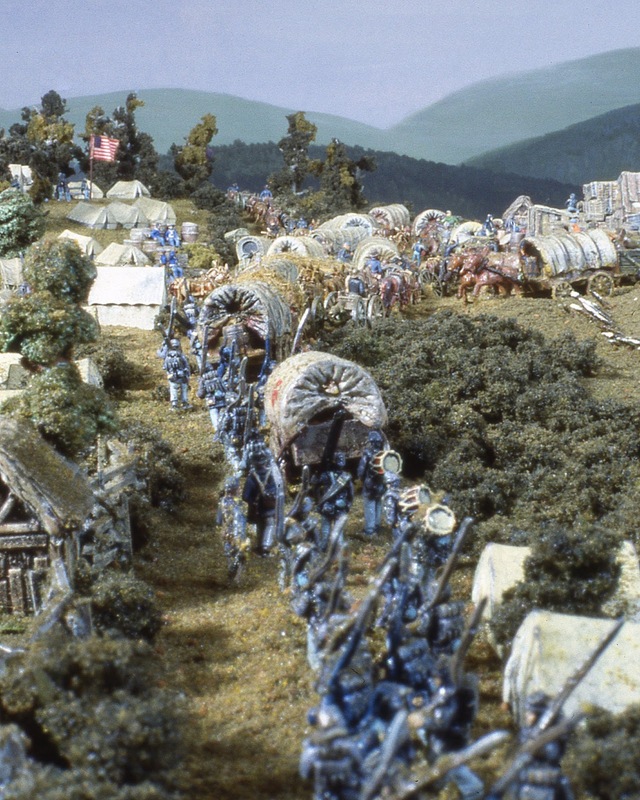 In his life he worked as a professional defense analyst, ran a hobby shop, owned a game publishing company, and had a beautiful narrow gauge model railroad But he really loved war gaming, especially the civil war. He is survived by his wife Lu, and daughter Stephanie. I will really miss him. The last part of the Lincoln Funeral Train project was to make a model of Lincoln's coffin and one of the Veteran Reserve Guards. References indicate that the coffin was only 6' 6" long, a tight fit for the 6'4" President. The coffin is black with laser engraved details. It was hard to get a decent photo of it. I placed the coffin on a small platform that is cover with black drapes. The soldier measures about 6 feet tall. The figure started as a Monarch Miniatures Gunner. I added the belts, epaulettes and other details to depict a Veteran Reserve Guard. The platform and the figure are on a small section of wooden floor. 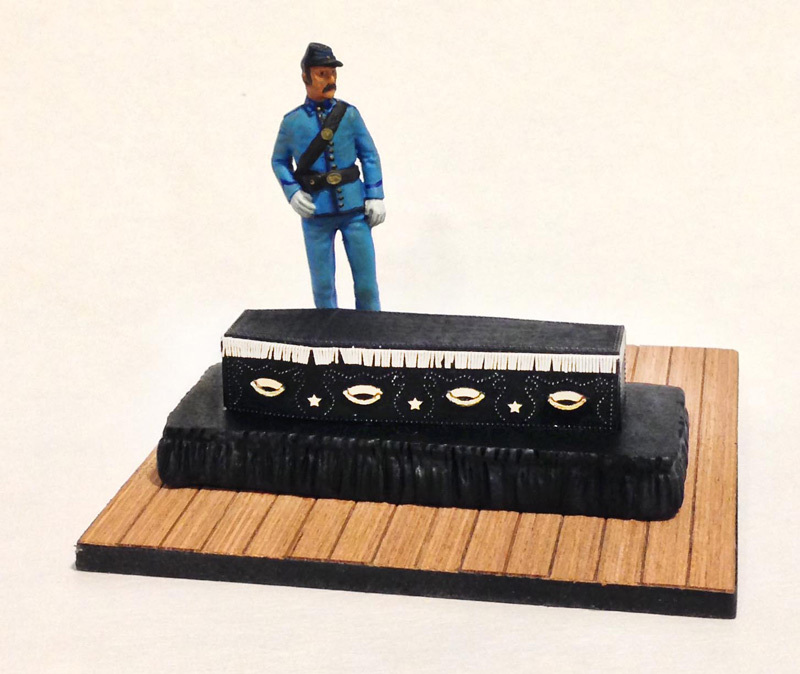 I did not have any photos of the coffin on display in Baltimore, so I kept this simple.